1. For the best ratio, follow the 60/40 formula. For example: 3 cups fruit, 2 cups dark leafy greens, 1-2 cups of water. Makes 32-40 oz or 4-5 cups. 2. 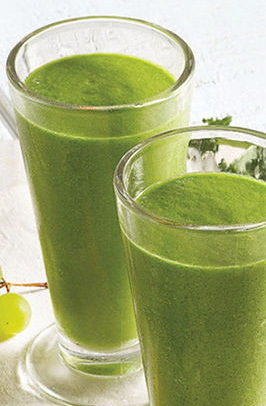 If bitter or too “green tasting,” add an extra dose of nature’s sweetener.Sometimes, smoothies can taste a little bitter or overpowering from the leafy greens. To fix this, just add a natural sweetner such as bananas, mango, apples, pears or pitted dates. 3.For optimal nutrient content, drink your smoothie right away. Fresh is always best, but sometimes you will have leftovers. Store in airtight containers, like a mason jar with lid, to limit oxidation (which breaks down nutrients and changes the color.) You can keep green smoothies in the fridge for 24 – 48 hours. 4.Change up your liquid base from time to time. Water is a great base for green smoothies, but it’s nice to change it up and incorporate more nutrients and vitamins occassionally. Coconut water is low in fat and calories, yet high in potassium, vitamins, minerals and electrolytes. For a more creamy texture, add unsweetened nut milks to your smoothies like almond milk or coconut milk, which are packed with bone-building calcium and vitamin E.
5.Want your green smoothie to be extra chilly? Freeze your favorite fruits like ripe bananas, grapes, pineapple or berries. This is also a great way to not waste ripe fruits and veggies. 2. Secure lid and blitz on high for one minute. 3. Serve immediately over ice. this article to him. Fairly certain he's going to have a good read. Thanks for sharing! produced that this regular coffee filter manner and then designed them how to coffee brewers. multiple-choice has to do with. Spread referring to chopped fresh garlic, a dash of a sea, which includes part pepper to your preference.